Always dreamed of joining the circus? Always wanted to be an acrobat? Your dreams may come true with the help of aerial yoga, a new type of yoga class that uses a fabric trapeze that looks very much like a hammock. The hammock is just a few feet off the ground so it is safe and slightly scary. You do not have the support of a mat or the ground, and you have to use muscles you haven't used before to maintain your stability. If acrobatics is not your typical workout, then aerial yoga is a step outside your comfort zone. This is a yoga studio that only teaches aerial yoga classes, which are called Unnata Aerial Yoga. I suspect the name is trademarked by the founders of this place, and its definition is: a new type of yoga that combines traditional yoga with the physical training of an aerial acrobat. I highly recommend this place since it is specialized in aerial yoga classes and the founder is a yoga teacher as well as an aerialist. The main studio is in Williamsburg, Brooklyn, and the second studio is on the Upper West Side – Amsterdam Ave and 76th Street. The website gives information about how to prepare for a class, what to bring, and what to expect. No experience in yoga or aerial acrobatics is needed to take a class. Founded by Christopher Harrison, AntiGravityYoga is described as a fitness regime. It is an aerial yoga class, but fitness regime sounds fancier. The owner is a former Broadway dancer and gymnast. 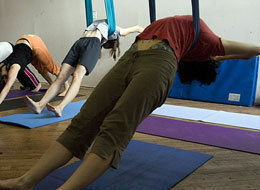 The AntiGravity Yoga classes can be found at Om Factory Yoga Center, at 265 West 37th Street in NYC. AntiGravity Yoga has been in several magazines and TV shows and from the looks of it, it seems to be a bit more daring than Unnata Aerial Yoga, which appears to have a more peaceful vibe. If you are afraid of the trapeze but yet want to try it, go for the first option, the Unnate Aerial Yoga. Classes seem to be laid back, small, and non-competitive. Overall it seems a more relaxed atmosphere. If you want to go a little crazier and fly on your hammock, then AntiGravity Yoga is the better choice. Founded by a dancer and a gymnast, it has more "aerial" and less "yoga" in it. If you always wanted to fly with the smoothness of an acrobat and keep the composure of a yogi, then aerial yoga might be the fusion you were looking for. Give it a try and tell your friends about it. It's not every day that someone can say: "I will have to call you later, I am on my way to an aerial yoga class." Why not be the first to say it? Hi Georgiana! Aerial yoga is such a great idea! Alot of my friends are into the trapeze activities but no one's ever done yoga. Fantastic! Thanks for the idea!